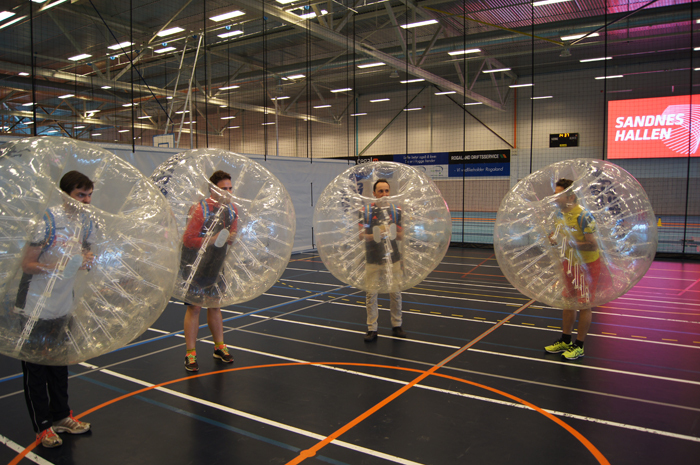 On the rest day, the players visited scholastic players at a local science museum, in addition to some friendly competition of "bubble soccer", fencing, and archery. 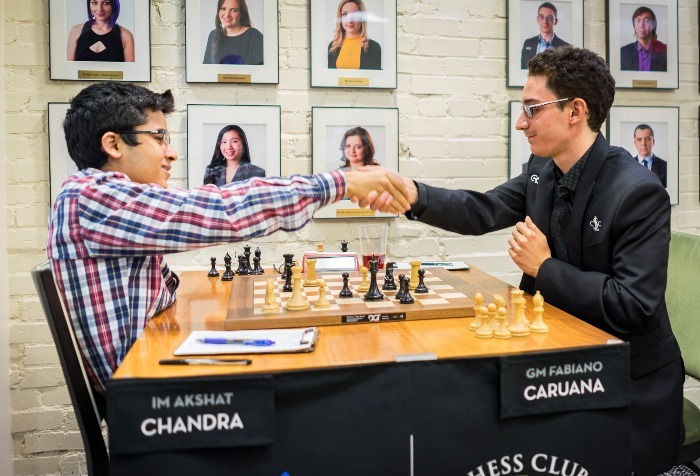 Fabiano Caruana won the US Chess Championship held from April 13-26,2016 at Chess Club and Scholastic Center of Saint Louis by a full point. Wesley So and Hikaru Nakamura drew their final games to ensure they finished in joint second place, qualifying for an 18-round blitz tournament with Garry Kasparov that takes place from April 28-29,2016. Nazi Paikidze’s win in the US Women’s Championship was more dramatic, with pre-round leader Tatev Abrahamyan losing to 15-year-old Ashritha Eswaran, while Paikidze beat Irina Krush with Black. 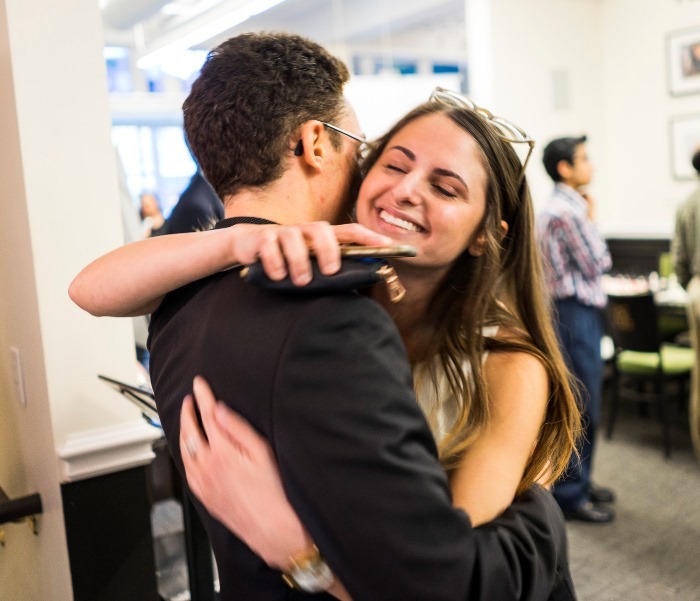 Alexandra Wiener congratulates Caruana on his US triumph! The Georgian Chess Federation, in partnership with the International Chess Federation (FIDE), is organizing the third leg of the FIDE Women's Grand Prix series 2015/2016.A round robin tournament with twelve of the best women players is being held in Batumi from the 19th of April until 2nd of May 2016.The participation of the two former Women's World Champions Maria Muzychuk and Alexandra Kosteniuk is an important part of attraction as well as the participation of 4(!) Georgian top women players : Nana Dzagnidze, Nino Batskiashvili, Bella Khotenashvili and Lela Javakishvili. After 6 rounds,Ukranian GM Anna Muzychuk is in the lead with 4/7 points. 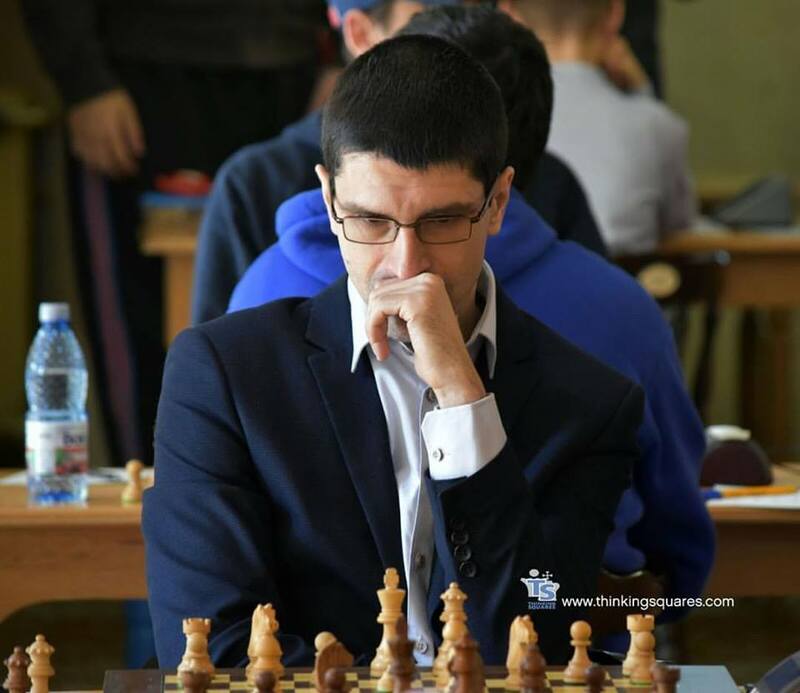 The Romanian National Championships were held from April 2-10 2016 in Baile Olanesti, a mountain resort famous for its thermal springs.It was a 51-player, nine round Swiss event with GM Constantin Lupulescu (2624) as the top seed. GM Mircea Parligras, who began as the second seed played sublime chess and won the tournament by a full point with a score of 7.5/9. Parligras - "Follow your dreams, and one day they will come true!" Dubai is a city known for its energy, optimism and openness to the people from across the globe. The eighteenth edition of Rashid Bin Hamdan Al Maktoum Cup opened on 10 April 2016 night and ended on 19 April 2016 at the Dubai Chess and Culture Club.The tournament established a new record in participation approximately 200 players from 41 countries, including 46 Grandmasters, of which 25 were rated above 2600.England’s Grandmaster Gawain Jones claimed the Dubai Open Chess Tournament after a masterful performance in the final round. The 16th Bangkok Chess Club Open was held in Thailand from April 10-17 with a record 331 players from 43 countries in the Open, Challengers and Blitz tournaments, including 13 Grandmasters. India's Surya Shekhar Ganguly won the tournament finishing ahead in the tiebreaker by the narrowest of margins over Spain's Paco Vallejo. Approximately 470 young players assembled at Ulaanbaatar in Mongolia for the Asian Youth Chess Championship 2016. The tournament began on 6th April 2016 and came to a close on 14 April 2016 with the Indians scooping up a total of eight medals — three golds, two silvers, and three bronzes.While Divya Deshmukh, Praggnanandhaa R., and Anwesha Mishra dominated their respective categories to win the gold medals, Harshita Guddanti, and Iniyan P. got home the silver medals. Khushi Khandelwal, Aditya Mittal, and Vaishali R. also scored the bronze in their categories. Team India with their prizes and medals. The winners in the rapid and blitz competitions were also awarded prizes simultaneously with the standard results. MAGNUS SPEAKS WITH THE "DEUTSCHE WELLE"
Three days before the Altibox Norway Chess tournament, Klaudia Prevezanos interviewed Current World Champion Magnus Carlsen for the "Deutsche Welle" and Carlsen talked about computers, his preparation for the Norway Chess tournament, the World Championship, and his relationship to Sergey Karjakin . #TariniGoyal...that's an excellent chess nugget!